The width of the bars of the series. The unit of width is the unit of x-axis. The minimum width for bars is zero and negative values are treated as zero. Setting the width to zero means that width of the bar on screen is one pixel no matter what the scale of x-axis is. Bars wider than zero are scaled with x-axis. 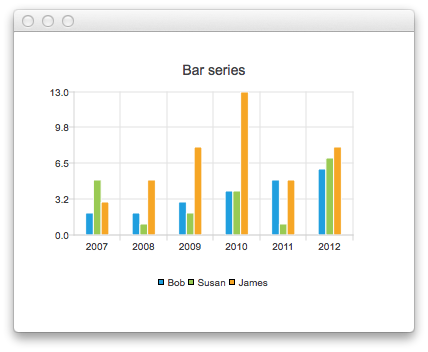 Note that with QBarSeries this value means the width of one group of bars instead of just one bar. Holds the number of sets in series. The format used for showing labels in series. Defines the position of value labels. Emitted when barset has been added to the series. Emitted when barset has been removed from the series. This signal is emitted when barset count has been changed, for example by append or remove. The signal is emitted if mouse is hovered on top of series. Parameter barset is the pointer of barset, where hover happened. Parameter status is true, if mouse entered on top of series, false if mouse left from top of series. Hovered bar inside the set is indexed by index. Signal is emitted when the angle of the value labels is changed. Signal is emitted when the position of value labels is changed. Returns bar set at index. Returns null if the index is not valid. Removes all barsets from the series. Inserts a new bar set with label and values to index. Values can be a list of reals or a list of XYPoints. If index is zero or smaller, the new barset is prepended. If the index is count or bigger, the new barset is appended. Removes the barset from the series. Returns true if successful, false otherwise.